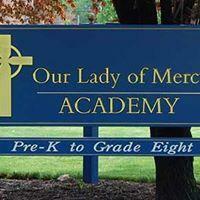 OUR LADY OF MERCY ACADEMY. PARK RIDGE, NJ. When Our Lady of Mercy Academy embarked on creating a new STEM LAB in its library, Principal Laraine Meehan was faced with the decision of what to do with all of the books. As a former English teacher and lover of literature, she was challenged with balancing the evolving educational needs of Our Lady of Mercy Academy. As the school year ended, teachers were invited into the Library to choose books to enhance their already robust classroom libraries. Miss Megan O'Shea, art teacher, made her selections to help her in creating a new Arts & Literature Program for our pre-k through 2nd grade students. The new program will replace weekly 'story time' with our youngest learners who will explore characters, setting, plots, and themes while blending literature and art together to create a new level of appreciation and understanding of the written word. Even after Our Lady of Mercy Academy teachers were presented with all that they would need to be successful, there were still many books left. It was at this time that the school opened its doors to give back to others whose programs would benefit from additional books. Excited teachers, curious parents, and happy children filled the library and made their selections. Educators from reading programs in the in South Hackensack and Paterson came and filled carloads of books to share with their students. Our friends at St. Paul's School in Valley Cottage arrived and took carts upon carts of books to enhance their school libraries. New friends were made and old friends were assisted as what had once been our treasure was now shared with others in need. At Our Lady of Mercy Academy, we believe that it is in giving that we truly receive. In the words of Pope Francis, "To live charitably means not looking out for our own interests…"
As we move forward creating a brand new educational space for all of our students to enjoy, we are humbled that our excess will be of help to other teachers and students in our area. They may now enjoy the treasures that can be gained from the easy accessibility to books.